By Clemente Lisi – NEW YORK, NY (Feb 18, 2013) US Soccer Players – For the first time in nine seasons, MLS will start without Will Hesmer. A member of the Columbus Crew for the past six seasons following a spell with Kansas City, Hesmer decided to retire last month. The Los Angeles Galaxy selected Hesmer, 31, in the Re-Entry Draft after the Crew declined his contract option. When the Galaxy signed Carlo Cudicini during the offseason, Hesmer decided to call it quits. “I am looking forward to watching the games as a fan this year,” Hesmer said when asked about the upcoming 2013 Major League Soccer season. Hesmer has been gone from a soccer field for some time. He suffered a hip injury that required surgery in April 2012. As a result, he sat out the entire season. At the same time, Hesmer’s back-up, Andy Gruenebaum, had a great season and supplanted Hesmer as the Crew’s starting keeper. Hesmer was one of the most successful goalkeepers in recent MLS history. A native of North Carolina, Hesmer played college soccer at Wake Forest from 2000 to 2003. Selected 17th overall in the MLS SuperDraft in 2004 by the Kansas City Wizards, Hesmer served as Tony Meola’s backup. By 2006, Hesmer had only made three appearances with the Wizards. His breakthrough season was 2007 when he played in 20 games for the Columbus Crew. Hesmer’s stock only rose from there. In 2008, Hesmer and the Crew won MLS Cup. Not surprisingly, the 2008 season is the one that stands out most for Hesmer. Even after the MLS Cup triumph, Hesmer continued to impress. He became the face of the Crew. In a game against Toronto FC in 2010, Hesmer became just the second goalkeeper in League history to score a goal. 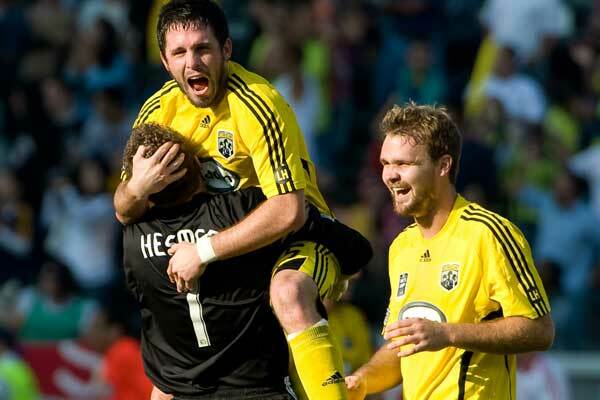 His stoppage time strike on October 16th following a goalmouth scramble gave the Crew a 2-2 draw and put Hesmer in the history books. Two weeks later, however, Hesmer’s luck changed when he suffered a right shoulder fracture following a collision with the Philadelphia Union’s Danny Califf. Hesmer missed the playoffs as a result that year. In April 2012, Hesmer had major surgery for pain in his right hip that had been nagging him for three years. Recovery sidelined him for the entire season. Hesmer didn’t know it at the time, but it would be the last season he would ever play. Last year, as Hesmer rehabbed from surgery, he continued to lay the groundwork for a life without soccer. Even though he hoped to return, Hesmer had already looked at his post-playing career options. He interned for Budros, Ruhlin, and Roe, a wealth-management firm, in Columbus. Hesmer had studied business administration and the two-year internship went a long way in helping him get on-the-job training. Hesmer has already left Columbus after taking a job at Raymond James in Raleigh, North Carolina. “I look forward to a new career challenge,” he said.